Zombie Marge Comix Group Blog: SWAG! We are just one short week away for the Cincinnati Comic Expo and expectations are running high here in the bunker. Zombie Marge will be well represented at the show. Table assignments just came out and we are very prominently positioned in the first row, center to greet the fans as they come through the door. Our new booth graphics will mirror the look of this blog with Marge’s lovely rotting face. I will be in attendance from the Friday night VIP reception, until closing time on Sunday. 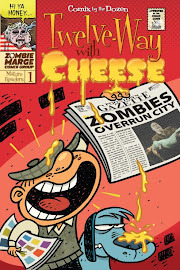 Joining me at various times during the weekend will be cartoonist extraordinaire Daryll Collins and our own Proofreadin’ Dale Trush, selling our usual array of goodies, Twelve-Way, Little Olden Books and SHAM Comics. 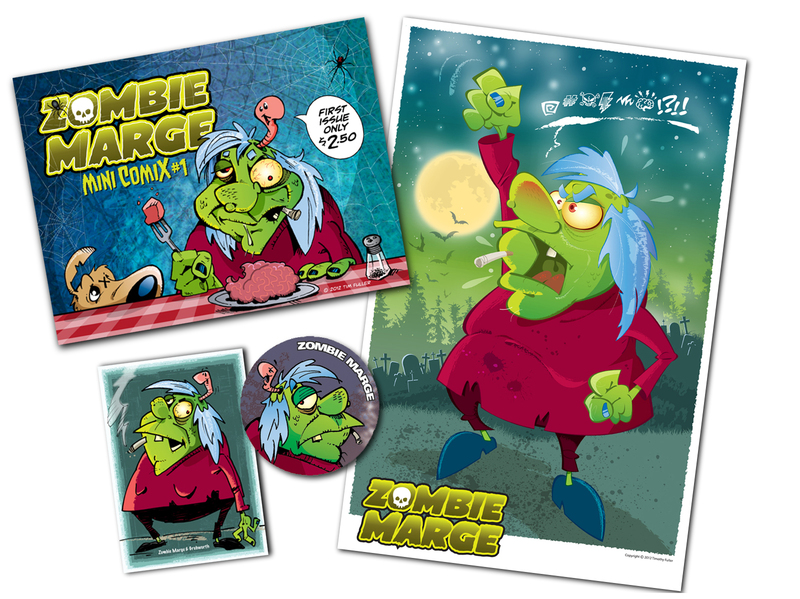 We will also be premiering several brand, spankin’ new Zombie Marge items this time. To tie into the blog, we have a mini-comic that collects the first batch of strips in a great little package. Signed art prints have been popular in the past and this time out we have a new Zombie Marge poster, suitable for framing. Just by stopping by the booth and saying hello, you can walk away with a cool little Zombie Marge pinback button for your lapel. And pick up a trading card while you’re there, both are free. The wife and I are going to try and make it down on Saturday. We'll miss you. But I'll see you before the Mid-Ohio con. Hey, where's my Zombie Marge comic? Tales from the Dealers Table!